The multi award winning LGBT Viaduct Showbar, provides weekly Cabaret Spectaculars with award winning Drag Queens as headliners, along with presenting some of the UK's biggest Drag Artists & Tribute Acts. The Viaduct team are loud and proud, and want to take show-stopping flamboyancy to the next level. Our team have been working with the bar on a number of various projects. Throughout each of these, we have impressed them with our dedication, hard work and enthusiasm, not to mention our unswerving time-keeping. 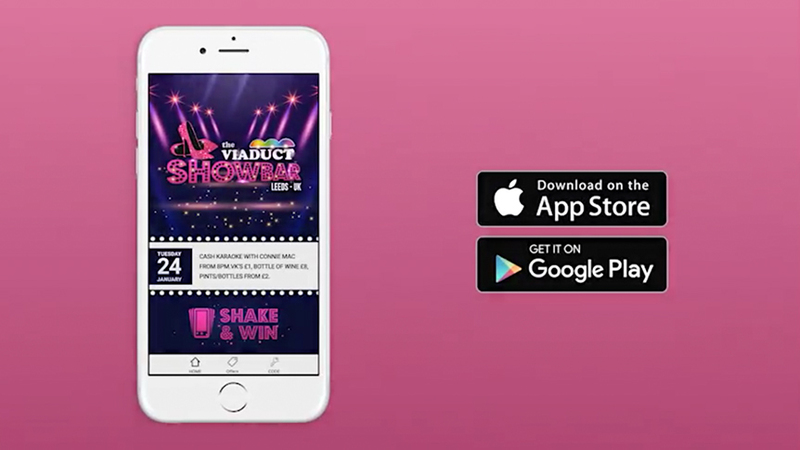 In September 2016, we had the honour of designing a mobile app for the Viaduct Showbar; we wanted to create something vivacious, colourful, something that would mirror the vibrant characters inside. The result was an interactive application with an exciting, fresh design that Viaduct could be proud of. We opted for a pink and purple theme, with striking strobe lights igniting the home page in glitz and glamour. An array of jewels and blinking fairy lights really gives the app a glitzy and extravagant feel. We also added a fun ‘shake and win’ feature to the app, whereby customers have the chance of winning free or discounted beverages on a daily basis. The Viaduct team were thrilled with the outcome, and have been promoting their app ever since.